First, stretch the deflated balloon a few number of times to make sure that inflation is easy. Now, use one hand to hold up the opening of your balloon at your mouth and the other to stretch out the balloon as you inflate it. Now slowly blow air in the balloon. 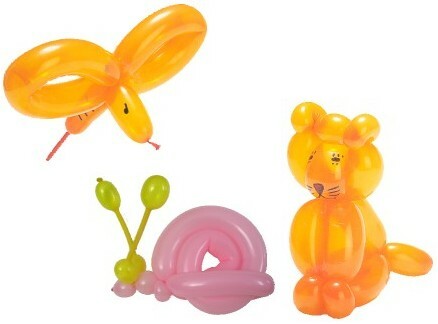 You must leave almost 5 or 6 inches of the balloon’s bottom deflated. Now, make a knot on he balloon’s opening. Now, use your thumb to measure one thumb distance from the balloon’s opening and squeeze it from there. Twist it for one whole rotation and hold onto that twist. This is the nose of the dog. Now, along the balloon, twist another two sections again at a thumb’s length in a whole rotation. These are the ears of the dog. Now hold the nose twist and bring that ear which is farther off from the knot toward this nose. Twist these two with each other at the joint of the nose. This is the head of the dog. Now, measure half a thumb along the balloon and twist to make the neck of your dog. Now, get measure of another two sections at a thumb’s length each and twist in a single rotation. These are the front legs of the dog. Now, hold onto the neck’s base, and get the front leg that is farther off from the balloon’s knot back to the neck. Twist these with each other in another rotation. For the body, again get a measure of a thumb’s length. Twist a whole rotation there. Again get measure of another two sections at a thumb’s length each and twist each in a rotation. These are the hind legs of the dog. Now hold onto the body’s base and get the hind leg that is farther off from the balloon’s knot back towards the dog’s body. Twist these in a rotation with each other. The portion left thereafter is the tail of the dog. After this, your dog shaped balloon is ready to please a child.